An optional alternate setting, that adds a little Miskatonic to Occultar's backstory. Five new characters: Marcy Bishop the restless artist, Taro Isoge the loyal Student Council lackey, Yvonne Legrasse the detective's daughter, Ambrose Quincy the sheltered jerk, and Lee Tillinghast the high-tech hustler. Four Ancient Ones drawn from the Cthulhu Mythos: Great Cthuhlu, Nyarlathotep (a "classic" version and their new Occultar avatar, Your Best Friend), and Shub-Niggurath. Ancient One writeups for alien Incursions by the Deep Ones and Mi-Go. New encounters, including Lovecraft's Ghost, Eko Onbekend the Deep One prophet, Herbert West—Science Teacher, and a statistically valid sample of the Thousand Young. The Great Old Ones are coming. To survive until your entrance exams, you'll need to solve mysteries, uncover terrible secrets, and find out which of your classmates are conspiring against you before it's too late! 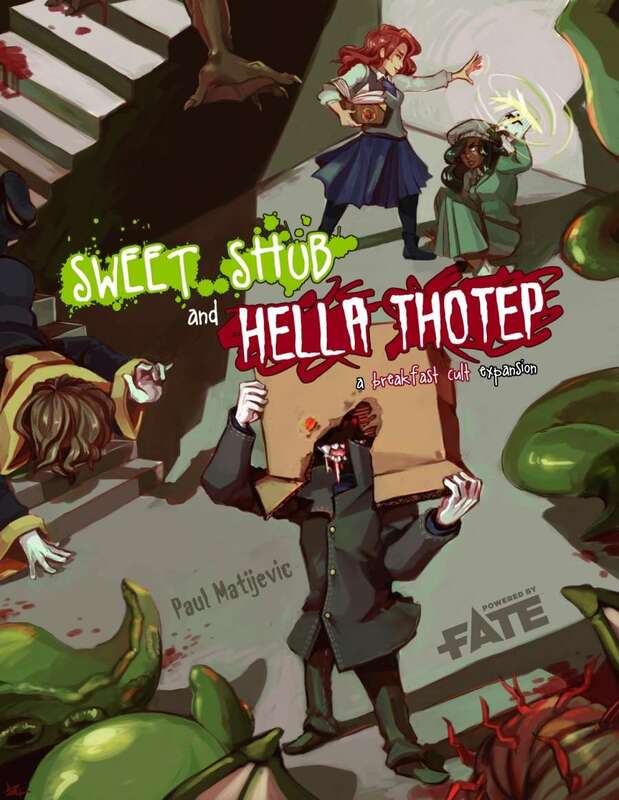 Sweet Shub And Hella Thotep was created as a stretch goal for the Breakfast Cult Kickstarter. Thanks to the backers for making this possible! I warned you about shoggaths, bro.